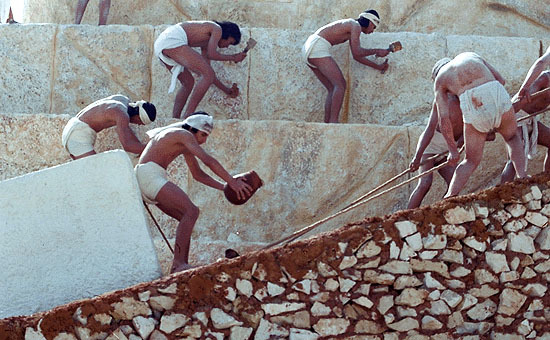 Pyramids were constructed by large work gangs over a period of many years. The Pyramid Age spans over a thousand years, starting in the third dynasty and ending in the Second Intermediate Period. The Greek historian Herodotus was told that it took 100,000 men 20 years to build the Great Pyramid at Giza. Scholars today, however, think it may have been built by only 20,000 men over 20 years. A pyramid's large square base creates a very stable structure. A number of astronomical observations were used to precisely align its corners with the four cardinal points. Approximately 80% of the building materials are found in the lower half. 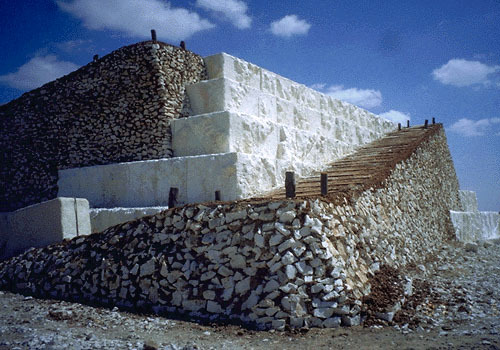 This means that relatively few stone blocks were hauled to the upper levels. 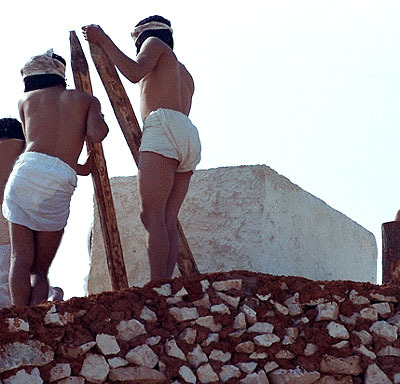 Since pyramids are solid, no walls or pillars were required to support the structure. Despite its simple design, a pyramid is an incredible engineering feat. Several theories attempt to explain how pyramids were constructed, but for now, the mystery has yet to be solved. One theory suggests that causeways were used to haul the stone blocks on wooden sleds up the side of the pyramids. The ramps were lubricated with water to reduce friction when hauling the blocks. As few as 10 men were needed to drag a stone block up a ramp. 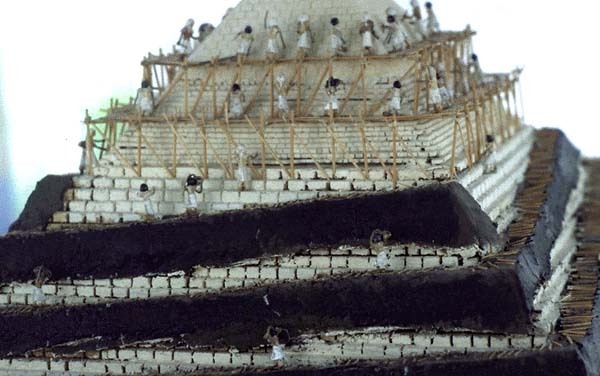 There may have been several ramps on each side of the pyramid at different levels, and a ramp may have been coiled around the pyramid as it grew in height. 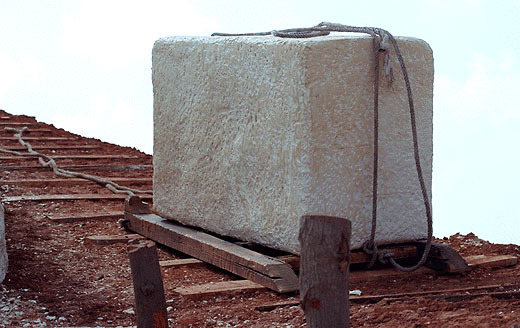 Once a stone block reached its desired level, wooden rockers may have been used to manoeuvre it into position. Another theory suggests that a wooden crane with a counterweight on one end may have been used to lift the blocks from one level to the next. This theory has been disputed, since the Egyptians did not have access to trees that were strong enough for this type of work. The average weight of the stone blocks used to build the Great Pyramid at Giza has been estimated at 2.5 tonnes (2.5 tons). Such an enormous weight would undoubtedly break a wooden crane before the block could be lifted. Another possibility involves the use of pulleys to hoist the blocks up the ramps and fulcrums to manipulate the blocks into place. Pulleys were used on ships at the time. The pyramids were probably not built by slaves because slave labour was not widely used in Egypt at the time. Peasant farmers, however, were required to spend a number of weeks working on construction projects. This provided the paid labour needed to build these gigantic structures. Since the fields were under water during the summer, wages earned in building the gigantic pyramids supplemented the family's income. Pyramids did not stand alone; they were part of a funerary complex. 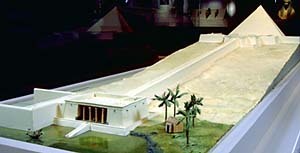 The complex includes a processional causeway that links a funerary temple to the pyramid, solar barques buried on the four sides of the pyramid, and mastabas and smaller pyramids where the family of the king and nobles were buried. The pyramid built by King Sahure (2491-2477 B.C., Old Kingdom) is the largest of the three at Abousir and the one that is best preserved. Today, it is a mound of rubble, but the mortuary temple on the east face is still discernible. Its striking features are the red granite date-palm columns and the deeply incised hieroglyphs of the king's name and titles on the huge granite blocks.